Girls’ Get together in Brignano, Bergamo (Italy), March 5, 2016. 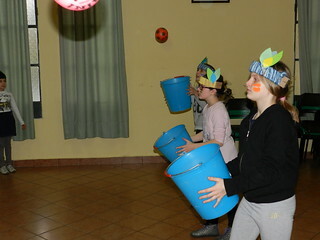 On Saturday March 5th, we had a get together for girls from first to fifth grade in Brignano. The weather seemed like it did not want to cooperate much, but we knew that for Our Mother there are no difficulties in Her get-togethers! Around 10 o'clock in the morning, the girls began to arrive. To dry ourselves from the torrential rain, we started the get together with a series of indoor games. Then we moved to the Chapel to greet Jesus and pray before the exposed Blessed Sacrament. Every girl was also able to write a personal prayer. The theme of the gatherings was 'You, learn much trust', said this way, in 'Indian' language, because that was what the whole day revolved around... And because in this way it is best understood! 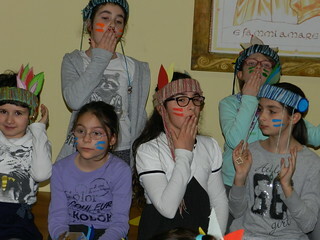 The following activity consisted in preparing something to wear on the head in order to better identify ourselves with our new identity, we made an Indian headdress, as they say in the tribe. When the craft was completed, the enthusiasm of the girls was awesome, they became mad with joy! So much so that they almost forgot how hungry they were.. .! After eating some delicious sandwiches and sweets that some had brought to share with others, we recovered our strength to continue on with our intense day. It was time for a moment of reflection on confidence, using a story about... that's right, Indians! After receiving inspirations, our Indians were already prepared for a great... Indian game! It consisted of several tests based on the normal life of an Indian: crossing rivers by canoe, building a tent (or teepee), decoding a message from Our Lady encoded in animals and plants, etc... The girls had a blast and despite the rain, we had a lot of fun. You can see for yourself by looking at the photos! We give thanks to Our Mother for allowing us to spend the day together and for showing us that everything is better when we leave it in Her hands.